“Not only do I have a natural smile but I have a healthy smile. Thank you Dr. Gorman,” said Heidi. Heidi had a history of having a near full mouth rehabilitation from 20+ years ago. They were of the porcelain to metal variety and were starting to break down. The unrestored lower front teeth were severely worn and there was gum recession to the point that many of the metal under-structures were starting to show at the gumlines. The gum recession also was uneven and aesthetically displeasing. 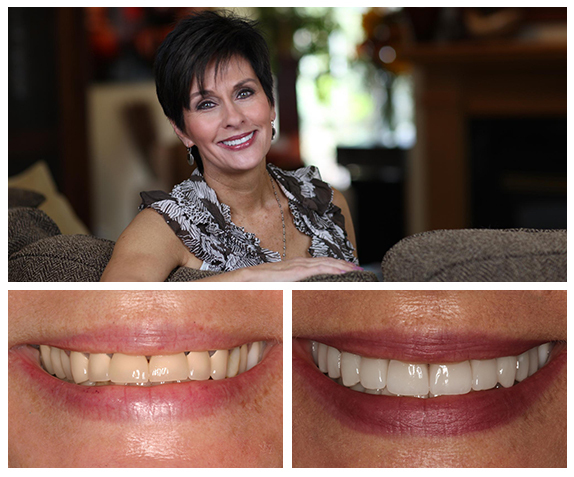 Heidi knew there was something new we could do, and we were able to restore her full mouth with porcelain only restorations after doing some minor laser therapy to even up the gums and create natural looking gum/tooth interfaces. Heidi feels her smile is completely refreshed after her full mouth rehabilitation by expert Minneapolis dentist, Dr. Gorman. A full mouth rehabilitation treatment plan requires a carefully thought-out planning process. Dr. Gorman will carefully analyze the health and function of your smile first, and aesthetics will naturally flow from there. We would love to help you restore your smile to robust health and youthful beauty. Contact us today for a friendly consultation. We look forward to getting to know you and your smile!